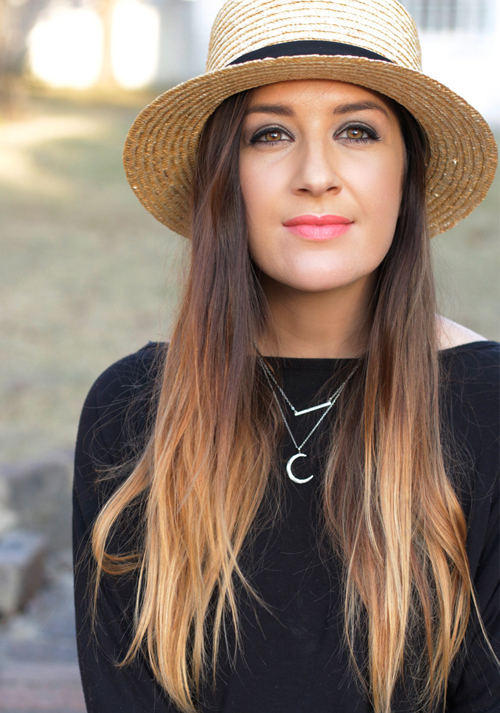 I recently made the big switch to Samsung and I tell you, it’s opened up a whole new world of smart phone awesomeness for me! Samsung’s tagline for it’s latest superhero, the Galaxy Note8 is Do Bigger Things and if ever there was truth in a statement, this my friends goes way beyond! Beyond what the Galaxy Note8 can do, it offers you more – with a bigger, sleeker and sexier screen. The 6.3″ display is like an endless infinity pool, where no harsh borders cut off your content. And even though it’s bigger than most phones, it’s tall and slim (rather than fat and bulky) it fits quite comfortably in your palm. 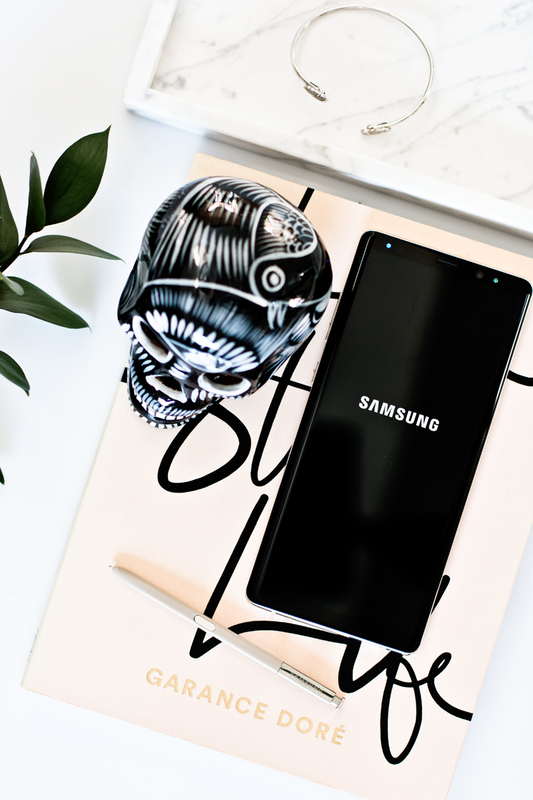 I partnered with Samsung Mobile to see just what this phone could do, and I’m so impressed with it, that now, I can’t live without it! Of course, getting used to the Note8 and a different operating system took a bit of time, but it was actually quite seamless, with only a few little bumps along the way. I’ve had my Note8 for just over two months and I’ve really fallen in love with it. 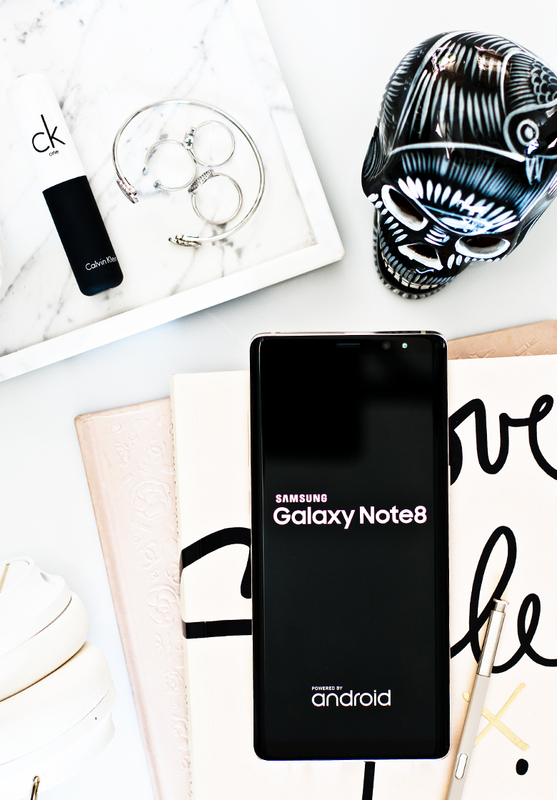 It’s so much more than just a smart phone; it’s everything, but the difference with the Note8 is that it’s everything done bigger, better and more seamless! 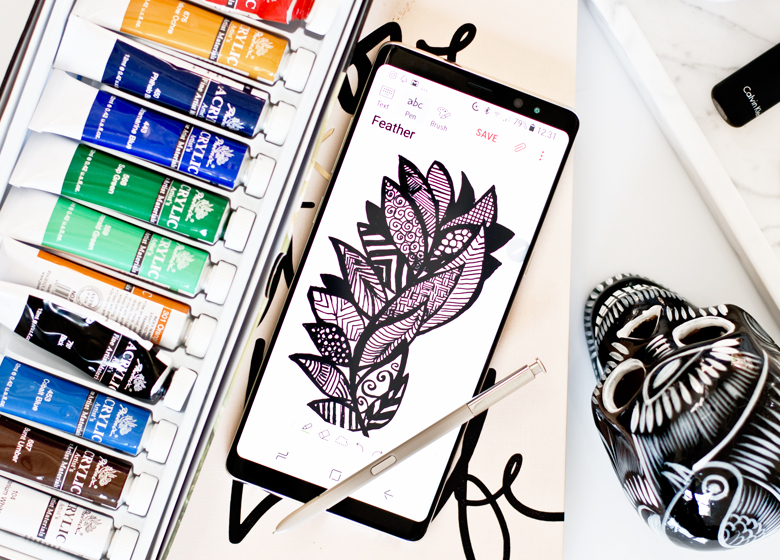 So, if you’re looking for a new phone, or if you’ve had your eye on the shiny, new Galaxy Note8, I’m going to share some of my favourite features, that may help you make that final decision. Let’s just get this out of the way real quick. The Samsung Galaxy Note8 takes amazing photos! I mean, really, really amazing! Razor sharp quality, with the option to shoot in Pro Mode and save your files to super high quality RAW (so you can edit them like a pro)! You’ll see on my Turkish Mosque post, we used only the Galaxy Note8 Camera to shoot the entire story. Apart from a little brightening on the pics, I kept them as standard as possible to show you just how amazing this camera is. The Samsung Galaxy Note8 features dual back cameras as well as a front facing camera. The wide lens and telephoto lens on the back, gives you the option to capture both a wide angle shot and a super arty picture, where you can blur the background and adjust the depth of field. This feature is awesome, especially since I usually have to shoot my OOTD pics using my DSLR with a 50mm lens to get that same bokeh effect. I like that, when you shoot in Live Mode you can decide on how much background blur you want even after you’ve shot the image. The front camera takes fantastic selfies too, and you can even perfect your skin tone. But besides that, the Wide Selfie mode lets you include your entire entourage, without chopping anyone out. 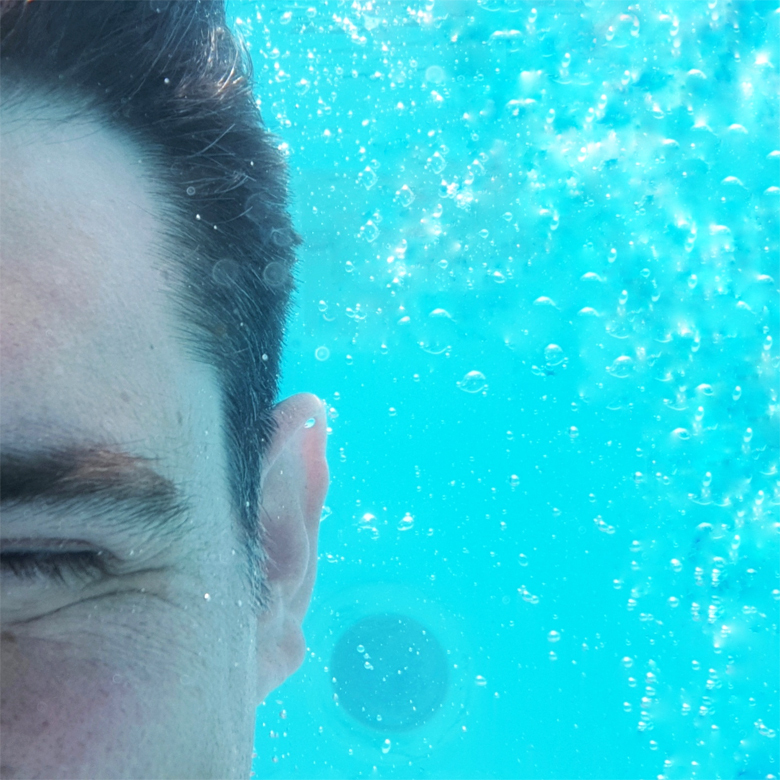 It’s not enough that the Galaxy Note8 is water resistant, but it’s the perfect phone for the poolside, as you can dunk it underwater and take a photo! I won’t lie, I was terrified to try this feature. My first reaction was, “no way, I don’t trust that my phone will be ok afterwards”, so like a scaredy cat, I dangled it over the water refusing to let go. My hubby, clearly the more daring one, took it underwater and snapped this super cool selfie! After my Galaxy Note8’s little dunk, I let the phone dry out for about 10 minutes and it’s perfectly fine! The only thing with shooting underwater, is that the touch screen does become a bit difficult to work with, but you can always use the volume buttons to snap the shot. This is a feature I didn’t realize how much I needed and now I just can’t do without it! The S Pen on the Galaxy Note8 is pressure sensitive, so you can draw authentic stokes and it feels and sounds like you’re writing on paper! Turn up the volume and you will hear the brush strokes. I’ve been using my S Pen for everything! I love taking hand written notes and having the Galaxy Note8 means I don’t have to carry a notebook to launches and events. The best part about taking notes on the Galaxy Note8, is that the S Pen activates without using power. So, let’s say you want to quickly jot something down, just pull out the S Pen (which by the way, matches the phone colour of your choice) and you can scribble on the black screen without unlocking the phone. Then there’s also the SwiftKey keyboard which is one of my favourite add-on phone features. Using it, you can type keys normally, or use the S Pen (or your finger) to slide around the keyboard to create words. This is so much easier, quicker and feels more natural than tapping keys. Another feature I’m now really into (thanks to having an S Pen) is doodling and colouring. You can download the PenUp app from the Galaxy Store and colour in hundreds of templates and make them really cool, or you can scribble doodles from scratch in your Samsung Notes. One of the main attractions of the Galaxy Note8 is Bixby. Bixby is Samsung’s voice activated assistant and she’s pretty cool and super handy to have around. She takes some time to get used to you, but she gets smarter and smarter with every use. You can also manually customize her. One of the features I like using Bixby for is obviously adding diary reminders and playing songs, but did you know you can ask Bixby to take a photo or a selfie and send it to your Whatsapp friends? So cool! And Bixby Vision is even cooler! Use it to help you pick the perfect wine pairing for your meal. You just have to let the camera see the wine bottle label, select Bixby Vision and she’ll search through an extensive database of wines and find your bottle. I tried this with a few wines I had at home and most of the “good ones” picked up easily. I’m no wine connoisseur, so this such a handy feature if I’m bringing wine to a dinner party and I’m not sure what would be a good choice! One of my most used Galaxy Note8 features is that I can split the screen in two, to allow me to do two things at once without closing the window. This is incredibly helpful when I want to listen to a Whatsapp Voice Note for example, but I’m using Waze to Navigate and I don’t want to miss my turn off. Or when I’m uploading an image to my Instagram and want to copy my caption from my notes. Or when I’m replying to a message and need to calculate something. Basically, every situation I’m in, I always need more than one window, so this feature is very handy! One of the cool features of the Samsung Galaxy Note8 is that you can listen together! No more needing a splitter jack to connect two sets of headphones. If you both have blue tooth headphones, you can connect them together and listen to the same song, or watch the same movie from one device. Also worth a mention is that the Galaxy Note8 still comes with a standard headphone jack (YAY), so you’re not forced to invest in bluetooth headphones. And speaking of headphones, the premium AKG ones that come standard with the Galaxy Note8 are pretty good, with a cord that doesn’t tangle. I wont lie, getting used to the Galaxy Note8 after years on IOS took some time, but once I got the hang of it, I now get the appeal of Android and especially the Galaxy Note8. The only frustrating thing was getting used to the deeply saturated screen of the Galaxy versus my iPhone. The colours on the Samsung look more vibrant, more vivid and movies are amazing to watch, but going through some of my old iPhone photos, I didn’t like how contrasty they looked. I played around with the display settings a bit and have managed to find a perfect screen display for me. I use the Adaptive Display and have adjusted the blue slider all the way up, so that way, I still get that somewhat bluer display that I’m so used to on my MAC computer screens. That’s about the only thing that took some getting used to! Oh and also the different icon layouts, but mainly it was figuring out what settings I liked – haha. The thing with Samsung is that you can customize the phone so much! This is awesome when you know what you’re doing, but coming from a phone that was more “standard” in settings, I had to play around to see what worked. I was really not looking forward to moving my old content from IOS to my new Galaxy Note8, but I wanted to give this phone the proper trial before deciding and I ended up being quite surprised at how simple and easy it was. Using SmartSwitch, I literally just connected my two phones and left it while it transferred absolutely everything to my new Galaxy Note8. I didn’t lose any of my notes, calendar dates or pictures, although for some reason my picture gallery was a bit muddled. Nothing a bit of organizing couldn’t fix. So do I love this phone enough to keep it? I know my hubby is not happy about that, since he was secretly hoping I’d be too used to my IOS environment to move to Android, but I’m really glad for this collab with Samsung which opened my eyes to the wonderful, blissful world of the Galaxy Note8. A world where Im going to continue doing bigger things!